Politics is indeed a dirty game and supposed not to be interwoven with freedom fighting. Anyone who brings politics in the Biafra quest is a political animal and needs to be distanced before such individual dents the image of our envisioned incorruptible Biafra nation. I’ve had my heart broken by the Nigerian system of politics over and over again, not as a candidate, but as a fervent observer and a political scientist. At times, I get miffed seeing people's favourite candidates losing, and the least favourite candidates inexplicably winning. I kept voting, of course. I kept paying close attention, but I couldn’t help noticing that when it comes to national issues and presidential candidates especially, my well-researched and considered opinions did not matter much because Nigerian politics have been structured to favour the Northerners by the British who see the people of Biafra as wise and then unfit to hold national or strategic offices so that their personal interests would not be threatened. 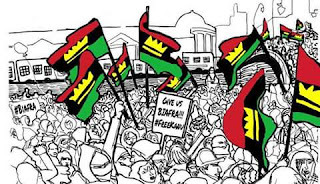 Truly, politics is not the solution and surest way of restoring Biafra. Our aspirations, our dreams and our Utopia of getting Biafra rests on the ballot box of referendum. Our inability to use our voters' card to enthrone justice in Nigeria when Chukwuemeka Ojukwu was disgraced at the presidential poll was as a result of forces seemingly beyond individual control which have combined to polarize the populace. Brother has been pitched against brother in Biafraland all because of dirty politics and those whom we have voted to protect us has become cowards and slaves dancing to the tune of the Fulani/Yoruba feudal lords. The truth is that, it is not the wish of those we voted to power to watch us suffer and die in the hands of our oppressors but because their minds have been darkened by evil associated with politics. Indeed, coalition of politics by politicians in Biafra restoration is totally annoying. Yes, and it’s detrimental to the unity and strength of our envisioned Biafra nation. Nonetheless, we can’t seem to restrain ourselves with the temptation that comes with politics and is clearly not the solution. For the first time in my life, I stopped participating in the activities of the Nigerian government and its politics, then I realised the bitterness of politics and how deceitful politicians can be. Votes in Nigeria does not count unlike what is obtainable in America and other western countries were citizens activates their votes to dethrone injustice and corruption. Little wonder whenever the word "election" is mentioned to the layman in Nigeria, the first thought that comes to mind is rigging, violence, and death. This brings to the concluding question: is this the system we are going to enmesh with Biafra? God forbid!